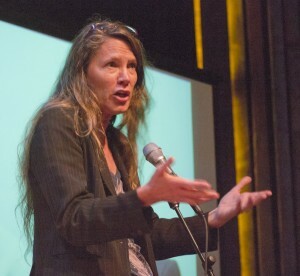 Kate Doyle speaking at Freight and Salvage in Berkeley. Photo Richard Bermack. Editor’s note: The following is an edited version of excerpts from Kate Doyle’s speech at the Berkeley event. My interest in Guatemala began when I was a student, when I learned that in 1954, the United States had engineered a coup against Guatemala’s elected president, Jacobo Árbenz, and installed a military dictator, beginning cycles of destruction and repression. A small guerrilla army grew up in the 1960s to challenge this repressive and corrupt regime, and as a result, the Guatemalan army, with the explicit and very direct support of the United States, planned and carried out a savage counterinsurgency. The military was funded, trained, and supported by U.S. government policy, through the doctrines of national security and anti-communism. These doctrines provided the ideological underpinning for a scorched earth operation carried out through all of Latin America, involving torture and disappearance. My organization, the National Security Archives, advocates for the right of any citizen to have information about what its own government does. We knew that when the U.S. formed close alliances with any government in the world, that relationship automatically generated paper documents, such as meeting minutes, travel notes, memoranda, intelligence reports, and all kinds of secret records. Beginning in the 1990s, we started to mine the CIA, State Department, and Pentagon archives by filing Freedom of Information Act requests. Slowly, over the course of 20 years, we accumulated thousands and thousands of declassified documents, creating our own secret archives. When human rights organizations or the families of disappeared couldn’t find information about what happened in their country through their own military or government, we could do that for them through the information we had collected on our own government agencies. In 1996, the horrible 30-year conflict in Guatemala ended with the formation of a truth commission, set up with United Nations support and an agreement between the guerrillas and the government. So we began to work with the truth commission. After two years of investigations, the commission presented its report at a public event in the national theater of Guatemala City. I went down there to witness the proceedings and to present the testimony of thousands of survivors of the massacres and their family members, such as Nestor and Samuel Villatoro, the sons of Amancio [a Guatemalan labor leader whose bones were exhumed on a military base]. The commissioners testified that they were hampered from carrying out their work by a lack of cooperation from the government and the military police in handing over documents and their denials that any documents or records even existed. One night that same week I was contacted at my hotel room and handed a military log book [containing military photographs and descriptions of the disappeared] that would become the first document from inside the killing machine that was the Guatemalan government in the 1980s. That military log book was the beginning. After that, government records were stolen or leaked and, in one very extraordinary case, accidentally found on a police base during a routine inspection by human rights investigators. All of these documents have now come together to provide the first real, concrete, and sometimes direct corroborative evidence of the crimes of the Guatemalan state. For the first time, we are now seeing human rights trials where the perpetrators of these crimes, leaders of the country, such as Efron Rios Montt, are being put on trial for human rights crimes, based not only on the testimony of these brave family members, but also increasingly on the innovative and creative forms of evidence, including the use of new technologies such as DNA testing. And it is not just me and Fredy, but hundreds of us that have been using this evidence to put together these prosecutions. It’s been an unbelievably rewarding experience, especially meeting people like Samuel and Nestor. Just to give you an idea of the climate that was Guatemala in 1984, Amancio, as a labor leader, was the target of constant surveillance and death threats. He knew there was a possibility that something would happen to him. So one day, when Nestor was about 16 years old, his father called him into his study and said, “I want to show you something. Look inside my mouth. You see the silver crown? If anything ever happens to me, remember it, and maybe you’ll be able to identify me.” That crown, along with the clothes he was wearing, was the first identifying feature, before the DNA tests, that linked Amancio’s body to his wife and children. One night that same week I was contacted at my hotel room and handed a military log book [containing military photographs and descriptions of the disappeared] that would become the first document from inside the killing machine that was the Guatemalan government in the 1980s. Guatemala is just one example of US intervention in foreign countries leading to brutal military dictatorships in the 20th century. My own country of Chile went through a similar period of time in the 70s and 80s. The difference, though, is that it seems as though justice is being served in Guatemala, whereas in Chile, known murderers from the military regime still walk freely through the streets. Chile’s legal system is inefficient. Thousands of people disappeared during the dictatorship and nearly all of them still haven’t been found. Chile should try to follow Guatemala’s example of bringing justice to the memory of those who died.